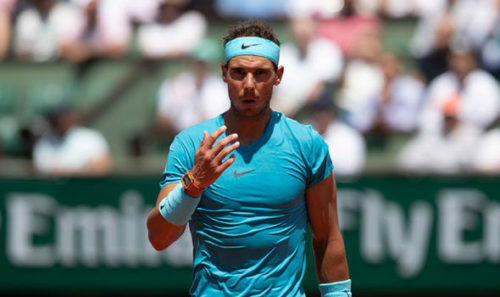 It turned out to be a dream week for Rafael Nadal as the ‘King of Clay’ won a record 11th French Open title after defeating Dominic Thiem 6-4 6-3 6-2 in Sunday’s final. Being the defending champion, Nadal didn’t add anything to his tally of 8770 points. His arch-rival, Roger Federer, at No. 2, is just one hundred points short of the Spaniard. And, Federer could surpass Nadal by reaching the final of ATP 250 Mercedes Cup in Stuttgart, given the fact that the latter is not playing this week. Notably, the Swiss ace had lost in the second round (to Tommy Haas) of the grass-court opener last year. Meanwhile, Federer has already begun his preparations in Stuttgart, hitting the court alongside Philipp Kohlschreiber of Germany on Sunday (see video below). The 20-time Grand Slam champion, who has got the top billing, has a bye first up. He will then take on either Mischa Zverev or Mikhail Youzhny. Apart from Federer, some of the other competitors including Lucas Pouille, Tomas Berdych, Nick Kyrgios, Denis Shapovalov, and Milos Raonic. The main draw action gets under way on Monday.